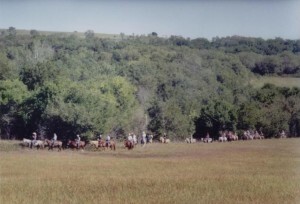 Equestrian trails in Eisenhower State Park. The inside loop is the Orange Loop and the outside loop is the Blue Loop. The Crooked Knee trails contain scenic views, lake accessibility, several wooded trails, and some rocky areas but are fairly easy. Cowboy Primitive Camp located on the lake shore just south of the day-use area This area has poles to tie to or set up your own pen. West Point Camp located south of Cowboy Camp has 15 sites with pipe corrals, water, and electric hook ups for each site. This area also contains a wash station and manure bunkers. There is a shower house close by the camp area that you may walk or drive to. 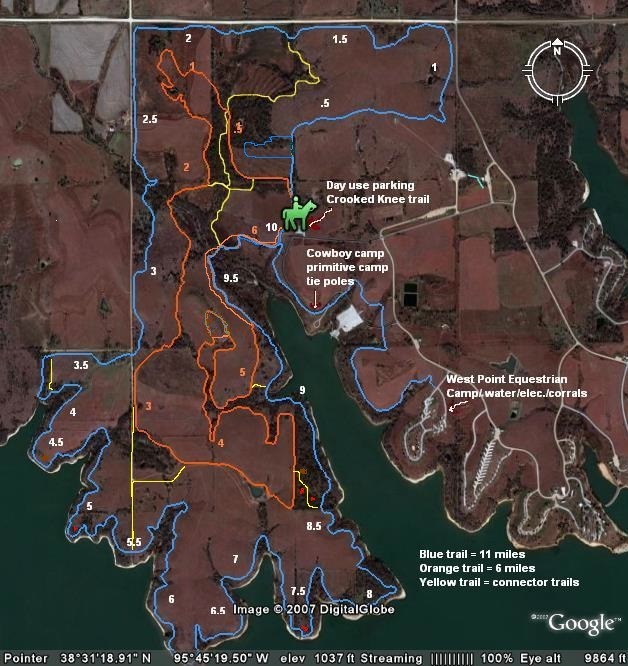 The trail system contains a blue blazed trail with about 11 miles that follow the lakeshore or park boundary through some wooded areas and across a few wet weather creeks. An orange blazed trail crosses three creek areas and circles the center of the park over some hills for about a 6-mile round trip. Yellow ribbons mark connector trails at the north end and through the woods. The orange trail is mowed and very easy to follow. Some of the blue and yellow trails are mowed where accessible and are also well marked. The Crooked Knee trails contain scenic views, lake accessibility, several wooded trails, and some rocky areas but are fairly easy trails for your horse.